In March, longtime and much beloved Staples High School choral teacher George Weigle turned 90 years old. Yesterday, he died peacefully. 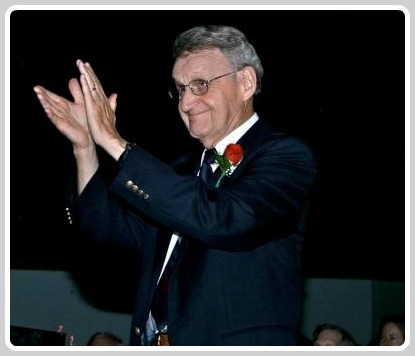 In his long career, Mr. Weigle influenced thousands of students. Barbara Sherburne was one. On his 90th birthday, she offered this tribute. It’s reprinted here, in honor of one of Westport’s most beloved educators. George grew up in Parkersburg, West Virginia. At West Virginia Wesleyan College he spotted a woman from Norwalk, Connecticut named Eleanor, singing in a talent show. He told a friend, “That’s the girl I’m going to marry.” It was love at first sight. George graduated in 1950, 2 years before Eleanor. They married on August 21, 1954. After 63 years, their marriage is still going strong. George studied for a year at Boston University after college. He taught school in West Virginia, then returned and earned his master’s in 1954 from BU. In 1980, West Virginia Wesleyan presented him with an honorary doctorate. In 1954, George heard about an opening at Bedford Junior High. He got the job, and after 5 years moved on to Staples High School. He taught there until 1988. Eleanor taught at Bedford Elementary School from 1954 until 1961. Some years later, she began private tutoring. George started the Orphenians in 1960. He named the group after his Orphenian quartet, led by his college music professor. Of course, Orpheus was a legendary Greek musician. George continued the Candlelight Concert tradition, begun in 1940 by John Ohanian. George and Eleanor bought a house on Robin Hill Road. They’ve lived there ever since. George told a fellow Westport music teacher — John Hanulik — about a vacant plot next door. The Hanuliks moved there in 1960, and John lived there until he died. Marie, his wife, still lives there. Having 2 incredible music teachers live next door to each other for so long is amazing. I was a student at Long Lots Junior High, in a music class taught by Mr. Hanulik. One day, Mr. Weigle came to speak to us about Staples. He seemed very stern, and scared me. Mr. Hanulik had an incredible sense of humor. I thought, “Uh oh.” I needn’t have worried. When I was applying to colleges, Mr. Weigle suggested West Virginia Wesleyan. That’s where I went. He wrote me freshman year, “Don’t burn the candle at both ends.” I wound up getting mononucleosis. I guess he saw something coming that I didn’t. 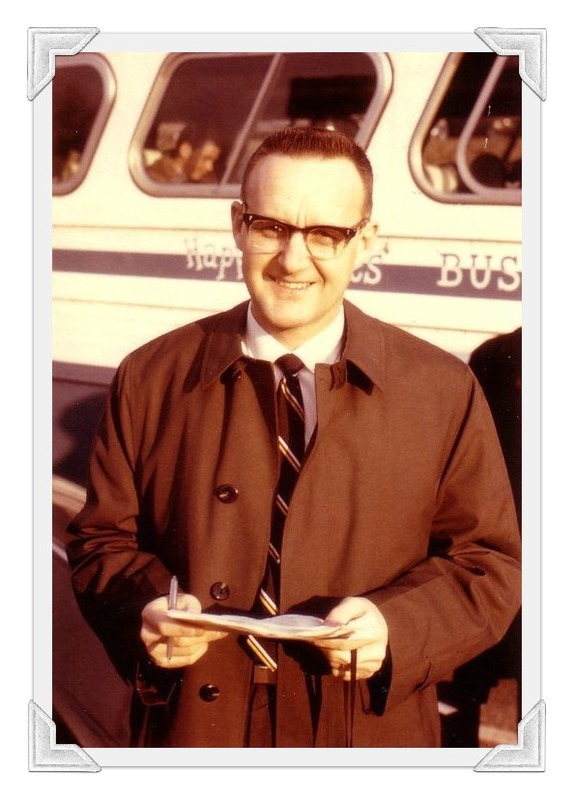 George was also choral director at the United Methodist Church, for 43 years (1954 to 1997). I sang at the Saugatuck Congregational Church, just up the hill from the Methodist Church. George invited me to join his adult choir, when I was still in high school. I’d do both, running down the hill to get to the Methodist Church in time. I sang whenever I could under George’s direction. When my mom passed away in 1978, he was part of the quartet that sang at her service. I’ve known George for a very long time. We communicated regularly all these years. He frequently sent me cassette tapes of Sunday services at the Methodist Church. He always sent a Christmas card, as did John Hanulik. They often arrived on the same day — and occasionally they chose the same card. George was like a father figure to me. I have a hard time believing he is 90. You can send cards to him at 10 Robin Hill Road. I’m sure he would appreciate hearing from you. He touched so many lives in so many ways. In 1954 John Ohanian brought me in for an interview. He took me to meet [principal] Norm Flint about an opening at Bedford Junior High. No one told me the kids had driven 3 choral teachers away the previous year, so I took the job. It was tough. Every morning Eleanor had to push me out the door. Every student had to take general music. My first 9th grade chorus had 50 girls. Gradually it got better. By my 3rd year we had boys singing in the chorus too. I went to Staples the second year it was open. The only electives the kids were offered were art, music and home ec – not the zillions of courses they have today. John had established the choral program, and I was in the right place at the right time. It was a popular group, and I had the junior highs feeding me. Looking back, I didn’t realize how fortunate I was. The Candlelight Concert is timeless. 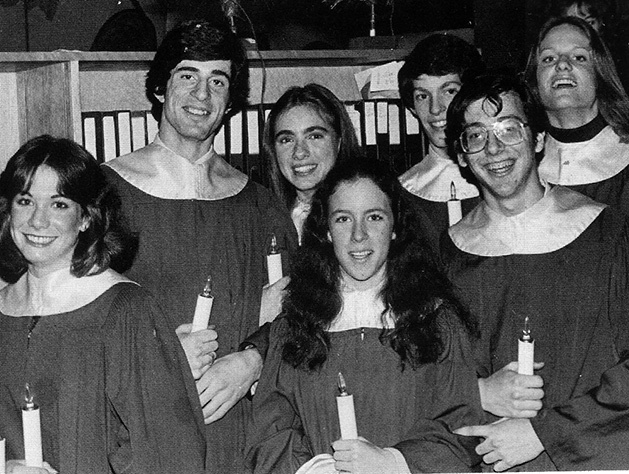 George Weigle directed these choir members in 1981 — as he did for 39 years. We gave 4 Candlelight Concerts each year. I’d get called in between performances, and reamed out – maybe I didn’t interpret a piece of music as I should have. Looking back, I realize John was right. He put me on a path, and guided me. I in turn demanded excellence from my students. I realize now that students understood what excellence was. The program grew, and so did its reputation. The harder the music, the better they performed – and the more they wanted. I gave them stuff I didn’t think high school kids could do, like John Corigliano’s “L’Invitation au Voyage.” It’s an extended piece, very contemporary, a cappella with duos and solos. Paul McKibbins’ “Psalm 67,” which he wrote and dedicated to me and the Orphenians, was the second most difficult piece. In 1960-61 I started a small group: Orphenians. We had auditions, and selected 24 to 28 singers. We met once a week after school at first, then twice a week. We did lose some of the guys to sports. From its small beginning, George Weigle’s Orphenians grew enormously. In 2010, the elite group celebrated its 50th anniversary. In 1966 we went to St. Croix, in the Virgin Islands, and in 1972 to France, Austria and Italy. We came in second in a choral festival in Italy. If I knew then what I know now, we would have been first. I didn’t recognize shadings of dynamics. From then on, I paid attention to it. We lost to a group from Oklahoma that met five days a week. In 1975 we went to Romania. That was an adventure! A very poor country, with very friendly people. We had to be careful what we sang. In 1978 we went to Poland. That was our first outdoor program. We sang the Polish national anthem. Afterward they told us that might have been too nationalistic. In 1981 we went to Belgium, France, Germany, Holland and Switzerland. On July 4th we sang at Notre Dame – it was filled with Americans. They asked us to sing “The Star-Spangled Banner,” which we’d never prepared. It went off okay. In 1983 we went to Spain. We sang concerts to packed halls at 10 p.m. – it was still light. And in 1985 we went to England, Wales and Scotland. Westport was growing, building schools, becoming more affluent. Parents wanted their kids to be in touch with the arts — not just academics. The quality of teachers was so high, because of who John hired – and fired. He made sure the right teachers were at the right levels. As a result kids attracted other kids, and it all just blossomed. Quality led to more quality. It was all because of John’s dream and perseverance. I think students – particularly at the high school – need the arts, in order to be enhanced and broadened. Here in Westport we’ve got doctors and lawyers who have been exposed to the arts. Westport people perform, and they’re concertgoers, and they see plays. The arts are so important to a rounded personality. Singing and playing with other people is so important. You don’t always realize when you’re in high school how meaningful it is. Sometimes it takes decades to sink in. But it does. It does. A lot of high schools have music. But not many have music at the level of Westport. Everyone who ever sang for George Weigle remembers the experience. Jon Gailmor, who still writes, performs and teaches, offered these thoughts. I was in the Class of 1966 at Staples. I was immersed in the performing arts, and they shaped my every waking moment in high school. With the Orphenians, I got my first taste of the power of music. I’ll never forget watching the faces of school kids in the Virgin Islands as we wailed away. And I remember watching senior citizens in Norwalk and Bridgeport being moved both to tears and guffaws by our songs. In the Staples a cappella choir and boys’ glee club, I experienced the indescribable joy of making a large, harmonious sound and filling auditoriums with its beauty. I loved a lot of things about Staples, but it was music where I really found out who I was and where my passion lay. I know quite a few fellow high school performers whose lives have been similarly sparked by our unforgettable musical experiences at Staples. Today I make and perform my own music, while helping other folks discover their creativity through songwriting residencies. I can honestly thank those three amazing years with George Weigle and my Staples brothers and sisters for the enormous role they played in helping me find my passionate life’s work. This entry was posted in Arts, People, Staples HS, Teenagers and tagged Barbara Sherburne, George Weigle, Jon Gailmor, Staples High School Orphenians. Bookmark the permalink. How fortunate we were to have sung with George Weigle…to travel to Europe with the Orphenians. Music is the ideal bridge between cultures and Mr Weigle started me on the path of a life full of choral music, now in the UK. Thank you, George! Thank you, Dan, for posting this. I called George every year on his birthday, but on his 90th, I never got to talk to him. Perhaps he was out somewhere for dinner. 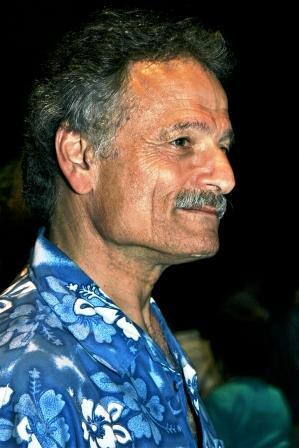 Every year he would say to me, “How do you always remember?” He was so cheerful and loved hearing from me and his other former students and would bring me up to date on which former students he was in contact with and what they were doing. So George is the last, in my book, of the great teachers we had: John Ohanian, Robert Genualdi, John Hanulik, and now George Weigle. Perhaps they’ll meet in heaven to make music together! God bless all of them. Mr. Weigle didn’t die. He lives forever in the hearts of his students, of which I was deeply blessed to be one. I’m almost 50 years out of Staples and there isn’t a holiday season that I don’t think of “Sing We Noel” even though its been 30 years since I had Christmas in Westport. As a father, there isn’t a Spring Graduation that I have attended without silently repeating “The Good Lord Bless You And Keep You.” I could easily get up on stage with my choral music classmates and perform under his direction as if we had rehearsed for the last three months. I was a minor player in Mr. Weigle’s grand love affair with any and all of his students but I have never forgotten him or lost my love and appreciation for some of the best years of my life that he gave me. As unique as he was to me, there are thousands of former Staples kids who I am sure would say the same about him. First, what wonderful tributes by Barbara and Jon. And, to illustrate how George Weigle and John Ohanian were apparently open to all types of music, a principal fundraiser for that first trip in 1966 to the Virgin Islands was a rock concert by The Remains held in the Staples auditorium. Barry Tashian ‘63 and Bill Briggs ‘64 were so delighted by the homecoming benefit concert and the fundraising effort that they had the band donate an additional $400 to the cause (which would amount to more than $3000 in today’s dollars). One thing I was somewhat surprised to read: that the Orphenians “did lose some of the guys to sports” in the beginning. I know that one of my soccer teammates was an Orphenian. Did the rehearsal schedule change over time? Or did the rehearsal time take place only in the winter and spring (thus allowing kids to play fall sports without any conflict)? Hi Fred, I was a case of varsity sports losing out to Orphenians. I loved the program so much I was in boys glee, choir and Orphenians same time. At that time in life the sports teams seemed to be more interested in hair length than in winning games. I always wore my hair short but for practicality not for politics but everyone except the musicians I sang with seemed to infer otherwise. The choral programs, at least for me, were the one place at Staples that I could just have fun. It didn’t matter what side of the fence you were on. Not that there wasn’t discipline (anybody who knew Mr. Weigle knew he was a tough taskmaster) but it was apolitical discipline. Music brings us all together and no one understood that more than George Weigle and his colleagues. George Weigle was THE BEST! He made choral singing both challenging and fun. 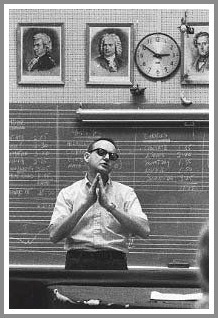 His humor complimented his musical teaching in a way that I have not experienced again. He planted seeds for the love of making choral music, and I continue to sing to this day. The farthest we went that I remember in 1964 was the Methodist Church on Church Lane (now Seabury Center), to perform for the Rotary Club! Look how far they go now! I was a 1964 graduate of Staples. George Weigle was an inspiration to all who had the honor of singing for him. 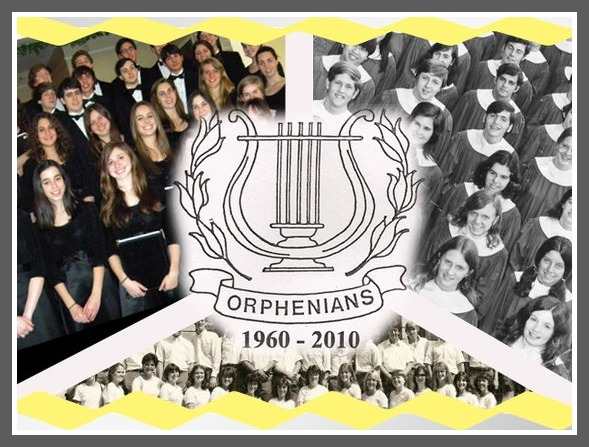 In many ways, the “Orphs” as we were sometimes known opened my mind and my heart to the joy of a cappella singing. Im still doing it 45 years later with The Whiffenpoof Alumni and I have Mr. Weigle to thank. A life well and fully lived. He will be missed. I just cannot imagine this world without George Weigle. My heart is breaking as I try to accept the fact that he is no longer with us. My experience at Staples with Mr. Weigle was the most positive time during my school years. I loved going to his class and singing my heart out. I was never that good but, Mr. Weigle always made beautiful sounds come out of us. I am so saddened by this news. He was the best and will be missed. Thanks for posting this Dan. The thing of it was, he instilled a love of music, choral and otherwise, in me. I remember working on “L’Invitation au Voyage.” It was hard but we could sing it – just took more work. The thing that amazed me the most was how the ensembles seemed to get better each year even though they were always 11th and 12th graders. I graduated in 69 and participated in chorus and glee club all 3 years. Orphenians for one year until Mr. Weigle kicked me out for missing practices. Yet, I always liked him and remained friends. We sang so very well under his firm and passionate leadership. A true legend. Very sad to hear this has come to pass. I owe my love of vocal and especially choral music, which has stayed with me thru all the years, to Dr. Weigle, and the impression he, and the music to which I was introduced thru him, will remain with me the rest of my life. I sang with him in ’71 and ’72, but we ran into each other every so often when I lived in Westport. One time, he came over to the house with a set of CDs containing concerts from the 70’s and 80’s. I will get them out tonight. . .and remember. George Weigle was an incredible teacher. He had the gift that all great teachers have; the ability to hold each student to a very high standard, while at the same time making each student aware that he was completely there for you. He was daring and bold as a choral director, and yet respectful of traditions. I was among those who had the opportunity to travel abroad with him, an experience none of us will ever forget. On a more personal level, his influence on me, and his encouragement to take my voice more seriously, helped shape the course of my life. All of us who have been in his orbit share a common love and admiration for him. He will be missed terribly. Godspeed, George Weigle. Please greet John O., John H., Robert G., Jack A., and all your other music and Staples colleagues for us. I’ve written a certain thought before in this blog and I’ll state it again. There are just three stages in the lives of people raised in the Westport Public Schools music program. First comes envy while watching tall and even scary-large high school students perform “Sing We Noel” at the annual Candlelight Concert while clad in their choir robes and gripping their candles in the darkened auditorium. Second is being one, for all too few years. Third is the longest and last stage, which is remembering it all for a lifetime. Eric William Buchroeder wrote about this third stage well in a comment posted earlier. Dost Thou Remember George Weigle? Yes, we do, gratefully.